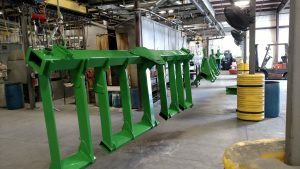 KVF has been tasked by a local Agricultural company to blast and paint their parts during the summer shut down. 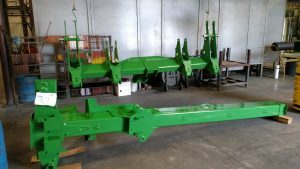 As you can see these parts are not your “normal” part, but rather large component assemblies that weigh upwards of 1500 lbs and max out at 22 ft long. KVF has proven that we can provide the process (blast and paint) and the finish to the customer specification for these larger parts. Let us know if you have parts of similar size you are needing to have processed!